Church Barn Cottage01263 715779work01603 870304fax Self-cateringThis pretty cottage is perfect for small families, groups and couples, and is situated in the grounds of the owner's home. The property sits in an unobtrusive area in the village of Field Dalling surrounded by plenty of paths to walk and routes to cycle. Only a few miles from the beautiful coastline, this property provides a quaint and welcoming stay. A good selection of pubs and restaurants are also nearby. 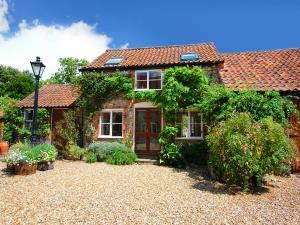 A lovely clematis clad brick and flint cottage in lovely countryside and close to the coast. This pretty cottage is perfect for small families, groups and couples, and is situated in the grounds of the owner's home. The property sits in an unobtrusive area in the village of Field Dalling surrounded by plenty of paths to walk and routes to cycle. Only a few miles from the beautiful coastline, this property provides a quaint and welcoming stay. A good selection of pubs and restaurants are also nearby.